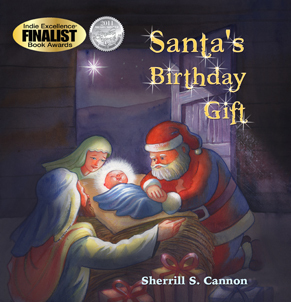 Santa’s Birthday Gift by Sherrill S. Cannon blends the story of Christmas with Santa to help explain to little ones how Santa has become a part of Christmas. 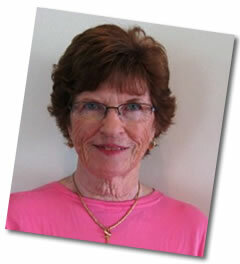 I have been very fortunate to have Sherrill S. Cannon as my featured author for the week. Sherrill (pronounced as Cheryl, yes I was curious enough to ask!) is a wife, mother to four, and grandmother to 10! She lives my dream life of spending a good portion of her time travelling from one side of the USA (I’d choose the Canadian equivalent) to the other with her husband to spend time with her scattered family. What a way to travel and enjoy the scenery at your own pace! After retiring (does a mother ever really retire? ), she decided she would look into having some of her books published. It was meant to be, and in the past 4 years she’s won 17 awards, and more are sure to come. Santa’s Birthday Gift was inspired after Sherrill read her grandchild the story of the Nativity. After the story was done, Kelsey asked, “But where’s Santa?” This book has an imaginative take on how Santa became the character he’s known as today. In beautiful rhyming meter, Sherrill tells the story of of a toy maker who sees a light in the sky and hears of baby Jesus’ birth. He wants to take one of his toys as a gift to him. 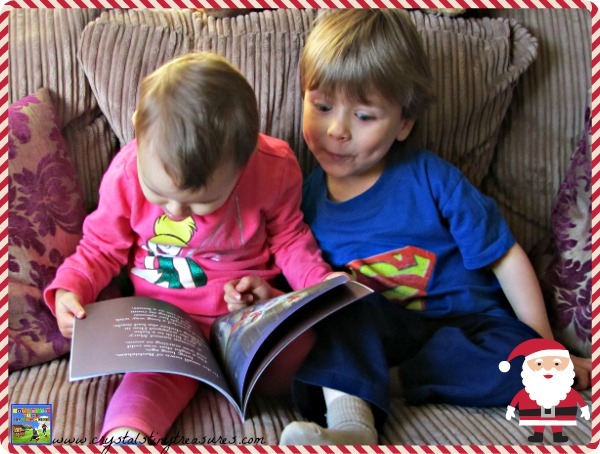 Tristan’s favourite part of the book is when Santa and his reindeer run out of snow. he’d be able to go. With Santa’s giving heart, he not only gave a gift to Jesus, he also gave gifts to everyone in attendance. With each gift he gave, another one appeared in his sack. His gift to Jesus was to return and give presents to all the good boys and girls around the world each year, and thus Sherrill weaves the mystery of Santa and the Nativity together. This book has been a great hit in our home! Sherrill is kindly providing a copy of Santa’s Birthday Gift for this giveaway. The contest runs from December 6 at 12:01am until December 13 at midnight and is open worldwide. There are several ways in which you can enter through the Rafflecopter below. If you’d like to see a little more about this, and other books Sherrill has written (Manner-Man, Gimme-Jimmy, The Magic Word, and Peter and the Whimper-Whineys, and My Fingerpaint Masterpiece), she has some sample pages available to read on Freado. “I love the music of words, and I try to help children hear that music…” If you like what you see, you can find out more about Sherrill on her webpage, follow her on Facebook, or learn more about raising money for the JM Foundation. Sherrill is also having a new book released in early 2014, so watch this space! For more books that we love, be sure to see our books and book activities page. 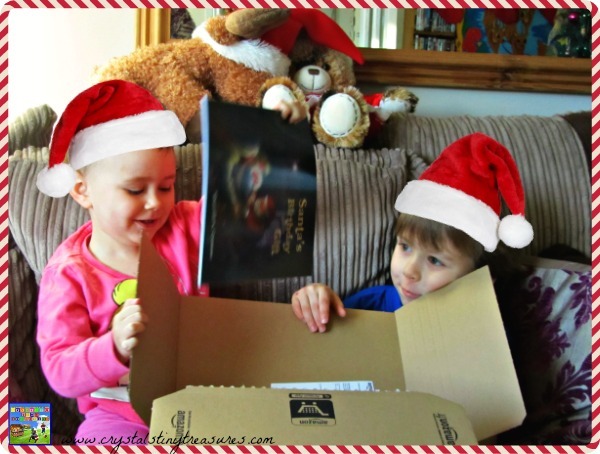 Or jingle over to our Christmas page for more activities. What a cute book! Would be a cute present and love the photos! I remember asking the same question as a child. This book would be a lovely way to ‘explain’ it. Aww, this book looks so sweet! I like how she put the story of Santa into the truth o the Nativity. We don’t really talk about Santa at our house, but this would be something I could read to the boys while still talking about the true meaning of Christmas. I enjoy that Santa was able to take something he enjoyed as his profession, and turn it into something for everyone. He has a generous heart, which is a good thing to teach. We thought about that as well, but in the end decided to go the children’s fantasy route. It’s a tough decision to make. My very favorite Christmas Carol is What Child is This. Part of the reason for this is that I absolutely LOVE the melody of Greensleeves that it is set to. White Christmas…just like the one I used to know. I love Away In A Manger. O Holy Night is always a favorite!! My favorite Christmas carol is Silent Night. Thanks.